Aims: Formation of a functional vascular system is essential and its formation is a highly regulated process initiated during embryogenesis, which continues to play important roles throughout life in both health and disease. In previous studies, Fzd5 was shown to be critically involved in this process and here we investigated the molecular mechanism by which endothelial loss of this receptor attenuates angiogenesis. 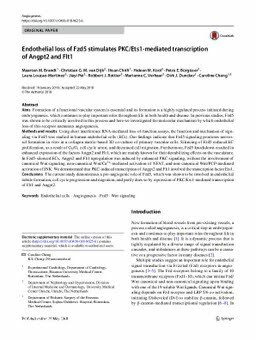 Methods and results: Using short interference RNA-mediated loss-of-function assays, the function and mechanism of signaling via Fzd5 was studied in human endothelial cells (ECs). Our findings indicate that Fzd5 signaling promotes neovessel formation in vitro in a collagen matrix-based 3D co-culture of primary vascular cells. Silencing of Fzd5 reduced EC proliferation, as a result of G0/G1 cell cycle arrest, and decreased cell migration. Furthermore, Fzd5 knockdown resulted in enhanced expression of the factors Angpt2 and Flt1, which are mainly known for their destabilizing effects on the vasculature. In Fzd5-silenced ECs, Angpt2 and Flt1 upregulation was induced by enhanced PKC signaling, without the involvement of canonical Wnt signaling, non-canonical Wnt/Ca2+-mediated activation of NFAT, and non-canonical Wnt/PCP-mediated activation of JNK. We demonstrated that PKC-induced transcription of Angpt2 and Flt1 involved the transcription factor Ets1. Conclusions: The current study demonstrates a pro-angiogenic role of Fzd5, which was shown to be involved in endothelial tubule formation, cell cycle progression and migration, and partly does so by repression of PKC/Ets1-mediated transcription of Flt1 and Angpt2.